Coalville rock and roll group Tranzit is going places…and quickly. If they succeed then £250 will be theirs plus an appearance on ATV’s New Faces show. The group has entered a similar competition at Coalville’s West End Club. This may also lead to auditions for the New Faces programme. 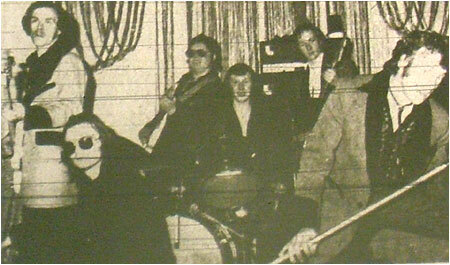 Tranzit, is a basic rock and roll group, “basic” because they only play original 1950s material. The group’s material includes numbers made famous by such artistes as Buddy Holly, Elvis Presley and Little Richard. Although the group admires the modern rock and roll bands, the members feel the music is too commercial. The group which only began to play together last March, has six members. They are Alan Holt, lead guitar; Barry Webster, rhythm guitar; Andy Whyatt, drums; Mike Shade, vocalist; Eddie Eaton, manager and stage effects, Dave Ward, bass. At present, the group is negotiating with Pontins Holidays for a summer season at one of their camps. If this is successful, the group will turn professional. The group’s style is original. The programme begins with the slower, ballad-like numbers gradually progressing to the faster, heavier pieces. These are popular with older members of the audience who remember the era of the 1950s. This has proved successful at the Ibstock British Legion Club and the West End Club. When the group appeared at the latter on Sunday, they attracted a capacity audience. The group now hopes to start a rock and roll society based at Whitwick Labour Club. Anyone interested in joining is invited to contact members of the group. TRANZIT…from left to right: Dave Ward, Ediie Eaton, Barry Webster, Andy Whyatt, Allan Holt and Mike Shade.